Can Coffee Make You Learn Faster? Back in 2012, the University of Pittsburgh carried out a study in left-hemisphere processing of positive words. But the study was on how caffeine can affect the brain’s language processing. Faster language processing means faster problem solving. It means more efficient communication with clients or customers. It means – mana from heaven – shorter and more effective meetings. Around one and a half coffee cups’ worth of caffeine in your system means a significant speed boost in understanding reading, memorising lists, short-term memory and even solving logic problems. 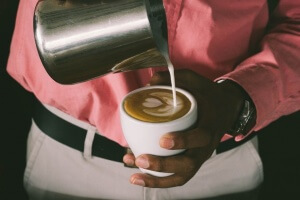 What that means in practice is that a typical business owner sees his team hit their stride properly late in the morning or even during their lunch break, but any workplace where the coffee’s easily brewed by a quick visit to a hot drinks machine can expect an earlier peak, as your team grab a cup as they arrive and another one an hour or so in. If they have their first cup of the day before their commute, you might see them reach that peak performance as early as half an hour into the working day, and having a coffee machine on standby will help them maintain the fuel they need throughout; no brewing roster, no kettle time, and no long, complicated lists and money collections while running to the nearest Starbucks or Costa. Your team doesn’t just save time, but the time they have is also spent more efficiently. There’s nothing better than that. One of the best ways to build up the effectiveness and productivity of your team is to make sure that it’s always easy to choose to top up your caffeine intake. If you’d like to know more about matching your coffee machine to your workplace, we’ve produced some useful guides and will be happy to talk to you in more detail – we’re available on 0800 3357 500.